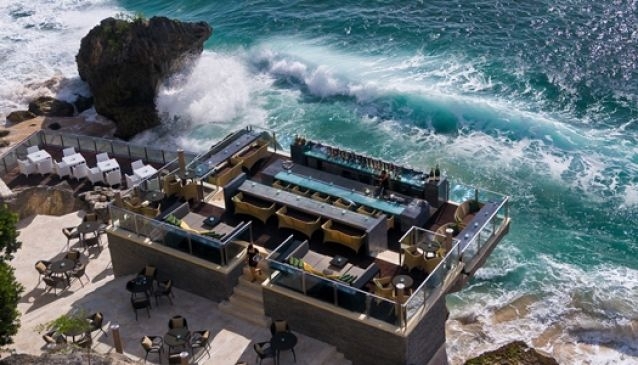 The whole Ayana resort runs a mile along the coastline, but the Rock bar is the epitome of luxury below the cliffs. Ayana is huge and has a hotel with 290 rooms as well as a number of luxury private villas for guests to retreat to. The CNN and The New York Times have both described the bar as one of the best in the entire world, and in 2011 it was voted the best venue to watch the sunset in Indonesia. Surely guests should not require any more encouragement than that. The bar has a 360 degree vista across cliffs, coral reef and ocean and guests are treated to the sound of the waves and the sun setting beyond the horizon every night. The bar was designed by a Japanese artist, meaning clean lines and minimalism are the focus of its vibrancy. The wooden decking and tables that surround the central bar all allow guests to experience the elegance and natural beauty at the Ayana resort but still feel intimate. At sunset the bar can be really busy and there may be queues so get in early or buy VIP passes to avoid disappointment. The dress code is formal after dark. Once the sun has set, get ready to party, with a wide selection of cocktails designed by the 'bar consultant' Bonnefoi. These cocktails are not your usual tipple, they use imported liquors blended with local herbs and fruits to enliven the senses and the party spirit. There is also entertainment with live bands, DJ's and regular appearances from guest sets with Andy Caldwell and DJ Bruno from the clubs of Ibiza.